Nebraska football fans know that in an era of scholarship limits, it’s hard to lose any players. But some players on a roster are harder to lose than others, and the effect of their absence on the squad is greater. As we prepare for new head coach Mike Riley’s first test, here are five of the players that Nebraska can least afford to lose. I know, I know, he’s hurt and is going to miss six to eight weeks (according to the Omaha World-Herald). But as a smart and particularly handsome analyst has observed already, if that timetable holds true then Nebraska might be well set to withstand his loss for those games, getting him back for the real meat of the season. And make no mistake, Nebraska is much better with a healthy Pierson-El. More than anyone else on the roster, Pierson-El is a proven game-changer in the return game, and was beginning to show his promise as a receiver. Add him in to Riley’s offense (with the jet sweeps alone) and he changes Nebraska’s offense and how defenses have to react. With recent news that Pierson-El might be out longer than the original timeframe given (according to Samuel McKewon of the Omaha World-Herald), Nebraska fans are rightly concerned about what impact the injury will have on the 2015 season. And while Riley should not give in to temptation and leave Pierson-El on the sideline until he can return without unreasonable risk of re-injury, his loss will be keenly felt if it does go longer than six to eight games. Armstrong might not be the quarterback Riley would have picked to run his offense, but he’s the quarterback Riley has inherited. And given the in ability of any other quarterback on the roster to legitimately challenge Armstrong for the position, it has to be assumed that Riley and his staff have concluded that Armstrong’s skill set gives Nebraska its best chance to be successful on offense. Indeed, in the installation of this year’s offense, the scheme is tailored to fit Armstrong’s strengths and desires. According to The Best College Sports News Network, offensive coordinator Danny Langsdorf said that he makes sure Armstrong is comfortable with a particular play before putting it into a game plan. That’s great news for Nebraska fans having nervous flashbacks to 2004, watching Joe Dailey try to run a Bill Callahan offense for which he was woefully unsuited. But it also means big trouble for Nebraska if Armstrong goes down and one of the backups has to get significant playing time. There’s good news coming from Nebraska camp about the NU offensive line coming into the season. According to 247 Sports, the offensive line is “beginning to gel,” which is crucial for Nebraska to have any chance at offensive success in a year when an new system is being implemented. But there’s only one returning starter on that line, senior left tackle Alex Lewis. His presence, particularly at such a crucially important position on the line for a right-handed quarterback, is central to Nebraska’s ability to get good play from its offensive line. And without that good play, it’s very difficult to see how Nebraska will succeed either running or throwing the ball. 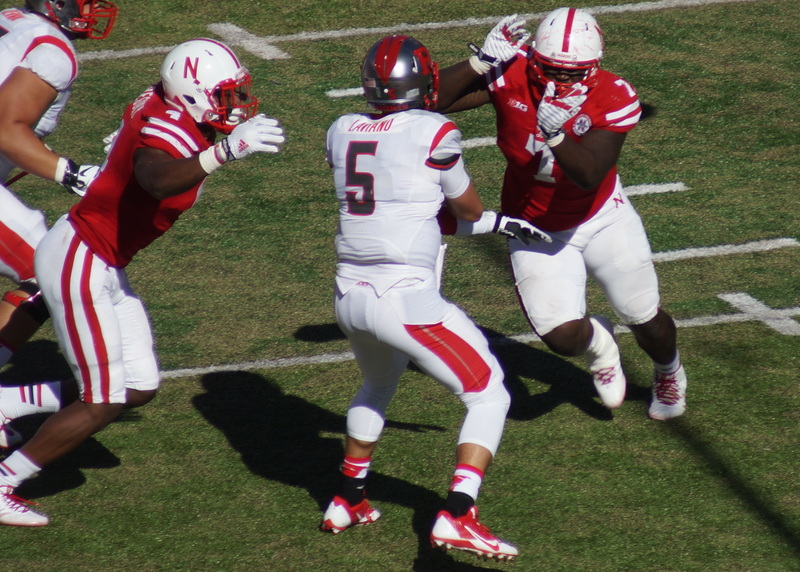 A survey of most reports from Nebraska’s fall camp has defensive tackle Collins being the best player on the team. According to Brian Christopherson of the Lincoln Journal-Star, Collins was one of the players cited by the Big Ten Network’s crew in their annual pre-season visit of B1G teams. And ESPN NFL draft analyst Todd McShay has Collins as a first-round pick in the 2016 NFL draft. That’s the kind of talent that is hard to replace. While defensive line is an area of strength for Nebraska, particularly on the interior with Vincent Valentine and Kevin Williams, the loss of Collins would be a huge step backwards. OK, so maybe the emergence of freshmen like Dedrick Young, Tyrin Ferguson, and Luke Gifford (according to Brian Christopherson of the Lincoln Journal-Star) can help quell the tinges of panic felt by Nebraska fans when they realize that there’s only one linebacker on the roster who started a game last year. But if something happens to that guy – specifically, middle linebacker Josh Banderas – then feel free to resume full-blown panic. Nebraska would then be left without any returning experience at a position of critical importance, particularly in new defensive coordinator Mark Banker’s quarters scheme. Which, of course is why practice reports from 247 Sports about Banderas being “day to day” with a groin injury should be terrifying for Nebraska fans. Less than two weeks away from taking the field against Taysom Hill and a solid BYU club, Nebraska’s only returning starter at linebacker isn’t practicing. According to 247 Sports, if Banderas couldn’t play then the middle linebacker spot would likely be filled by Ferguson or Chris Weber. Wrap your head around that, Husker fan. Nebraska could be facing BYU with a middle linebacker – you know, the guy who runs the back half of the defense – who is either a true freshman or a sophomore with a grand total of six career tackles. It may turn out to be nothing, but this groin injury to Banderas may very well be the biggest story being ignored in the run-up to the start of the 2015 season.